The extensive 1455 family consists of 22 sizes from the compact 60 x 45 x 25 mm to the largest 220 x 165 x 52 mm, all of which are now available in a durable red or blue anodised finish in addition to the original clear and black anodised options. The enclosure is designed to house PCBs mounted horizontally into internal slots in the body of the case or as an enclosure for any small electronic, electrical or pneumatic instrument. All sizes, apart from the smallest ones, have a removable slide cover on the case body to allow access to the PCB when it is in situ. 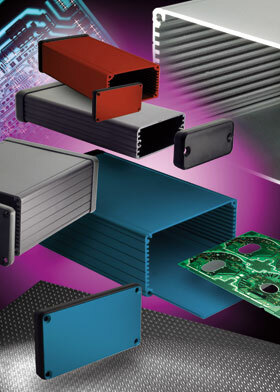 The 14 largest sizes are designed to accept a standard 100 x 160 mm or 100 x 220 mm Eurocard. All sizes of the 1455 are supplied complete with fixings and self-adhesive rubber feet; flange brackets that enable the unit to be mounted directly to a shelf or wall are also available as an optional accessory. Two types of end panels are available: either a flat aluminium panel, retained to the case body by a separate plastic bezel or an easy to machine one-piece moulded black ABS plastic end panel complete with integral bezel.